The all-time scoring leader at Needham High, Kailey Conry has lead the BU women’s lacrosse team in scoring the past two seasons. Boston University sophomore lacrosse standout Kailey Conry couldn’t have a better role model than her mother, Katie, who is enshrined in the Boston College Varsity Club Hall of Fame and was a member of the US women’s lacrosse team from 1990-92. KALEY CONRY: Patriot League first team. me leading girls’ lacrosse scorer and now as BU’s top scorer the past two seasons. In her first year at BU, Conry’s 68 points included a women’s program single-season record 54 assists. This season, which ended May 4 with a 15-6 loss to Loyola of Maryland in the Patriot League semi-finals, she had 27 goals and 43 assists, leaving her 12 helpers shy of breaking the program’s career assist record. A league second team all-star her first year, Conry was named to the first team this season as BU finished 10-8 overall, 5-4 in league play. 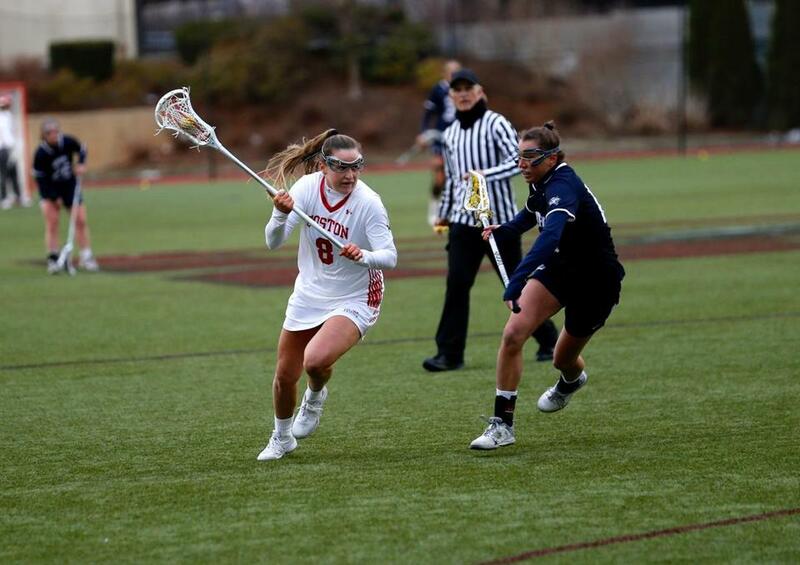 Conry, a 20-year-old psychology major, was a US Lacrosse All-American while at Needham High, where she also played field hockey, helping both teams win a combined seven Bay State Conference championships. Her mother, (nee Connelly) a former Globe Division 1 soccer player of the year while at Needham High, was a four-time All-New England pick in soccer and a three-time All-American in lacrosse at BC. Her father, Joe, competed in soccer and lacrosse at Needham High and Westfield State College. Her brother, Joey, played varsity golf and ice hockey at Needham High. Q. Your mom led the nation in assists in 1989 while playing lacrosse at BC. Was it hereditary? A. She was a phenomenal player and I feel that we both share the ability to see the field and also a love for the sport. Q. At what age were you introduced to lacrosse and what was your reaction? A. While in fifth grade with my friends on the town team. My mom was one of the coaches. It clicked right away. I felt it was something I could be doing for a long time. I’m ambidextrous, so being able to use both hands helped me develop my skills quicker. 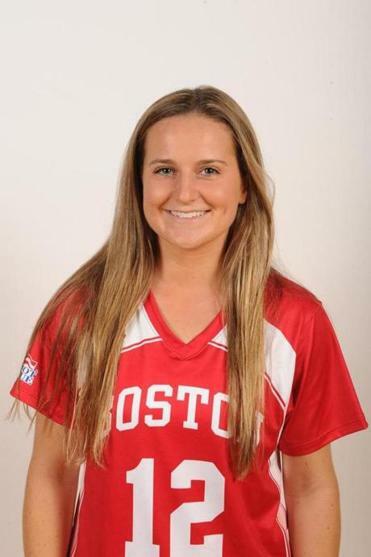 Q. BU junior Kaitlyn Belval, a Patriot League second-team all-star this season, was also your high school teammate. What has it been like to have her as a teammate? A. We grew up playing and competing together in ice hockey, soccer, and lacrosse. Her going to BU factored into my college decision because I admire her work ethic and dedication. She’s an amazing teammate and friend. Q. What is the best lacrosse advice your parents have given you? A. From my dad, to always keep my feet moving, and from mom, to work and put in the time to improve. Q. What did you like about growing up in Needham? A. Having lots of family there, and the opportunity to play all kinds of sports. Also, people in Needham are down to earth and care about each other, qualities that have been instilled in me. A. Taking classes at BU in sign language, coaching at BU’s lacrosse camp and catching up with high school friends and teammates home from college. And definitely rooting for Needham High girls’ lacrosse. Q. After your great first season, what did you work on to improve this year? A. As one of the older attackers in the team, I had to step into a leadership role, on and off the field. That also meant being more vocal. In games, I had to focus more on scoring goals because some of our taller cutters graduated last year. A. I love to surf. We rent a house on Higgins Beach, near Portland, Maine and it’s great family time and also keeps me in shape. My dad taught me and my brother to surf when we were youngsters.